North Carolina’s barrier islands are dynamic landforms in a state of constant change. UNC researchers want to better understand how those changes happen and what they mean for the future of our coast. Just a few steps from Southwinds Condominiums on Atlantic Beach, the top of an old wooden sign sticks out of the sand. “KEEP OFF THE” it reads. The word “DUNES” is buried. Laura Moore walks 50 feet past the sign, bends down and pulls on a tall strand of sea oats. When wind blows sand across the beach, these long, resilient grasses trap it, allowing dunes to form. More sea oats mean bigger dunes and better protection for the infrastructure behind them. Destroying dunes, or the sea oats that help them grow, is illegal. But Moore, a coastal researcher in the UNC College of Arts & Sciences, is not breaking any laws; she has a permit. 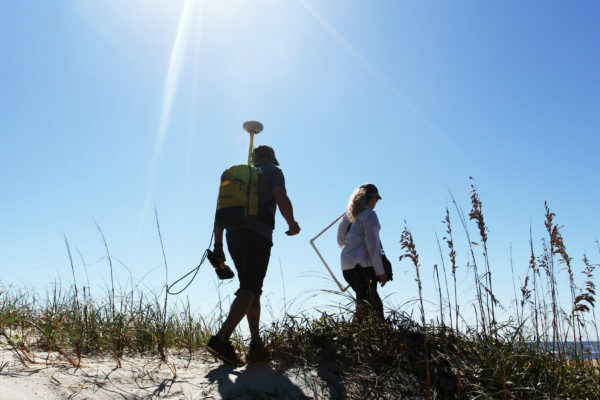 Along with a team of eight researchers from UNC and Oregon State University, Moore is collecting data to better understand the lifespan of coastal dunes. How do they form? What determines their shape? How well can they protect coastal infrastructure from storms? To answer these questions, Moore and Peter Ruggiero and Sally Hacker from Oregon State are surveying the vegetation and topography of the dunes on North Carolina’s Bogue Banks — which includes the residential and commercial developments of Atlantic Beach as well as Shackleford Banks, an undeveloped barrier island to the north. The researchers and their students hope this information will help them better understand how dunes grow. They picked a good time to come. It’s the second week of October, and Hurricane Matthew pounded this shoreline a week earlier. Moore, an associate professor of geological sciences and director of the Coastal Environmental Change Lab, examines the face of a dune where the grasses’ roots are exposed. “See how steep this face is?” she says, pointing to the front of the dune, where it looks like a bulldozer clawed away a large chunk. This vertical face is a scarp — evidence that a storm has caused significant erosion, she explains. Storm surge — the rise of water due to winds and atmospheric pressure during a large storm — is often the deadliest and most destructive component of a hurricane. The storm surge of one hurricane, in particular, raised a lot of interest (and funding) for dune research. “The entire East Coast was impacted by Hurricane Sandy to some degree,” Moore says, referring to the 2012 category 3 storm. “Locations that had a tall frontal dune fared much better than locations that didn’t have a dune at all.” Now the Army Corps of Engineers and communities affected by Sandy want more information on how dunes form, erode and protect. 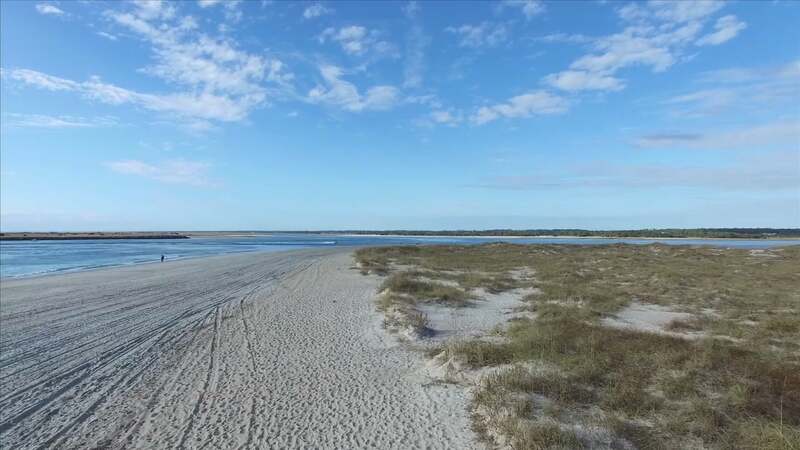 “Sometimes we forget that barrier islands provide more of a service than just a place for us to vacation or live at the water’s edge,” she adds. Barrier islands are not static — they are dynamic land masses that are made to move. Barrier islands shift through a process called overwash — storms raise the water level high above the dune, shearing the sand from the beach and dunes and depositing it on the interior, or backside, of the island. As the process repeats itself, islands slowly move landward, like the treads on a bulldozer. When a community erects a seawall, it prevents this transfer from happening. It builds a permanent line in the sand, according to Moore. Some coastal communities have beachfront homes that no longer have a beach — there are sandbags instead. “That’s a very possible future outcome if we attempt to ‘stabilize’ these landforms,” Moore says. Laura Moore and Peter Ruggiero bring their equipment to undeveloped natural dunes of Fort Macon State Park. Sea walls and sandbags are not the only options for managing erosion and preserving the existing infrastructure on barrier islands. Beach nourishment, a common process on North Carolina beaches, involves bringing in sand, either from offshore or an inlet, and pumping it into a desired location to rebuild the beach. “Since Hurricane Sandy, there has been a lot of interest in adding a dune component to beach nourishment projects,” Moore says. Moore and her collaborators have developed computer models to assess how different factors may affect dune growth. “We can look at how frequently the beach is nourished, and the time it takes for dunes to form — and assess the size and the width of dunes as they grow over a given time.” They can also run models to assess the effects of sea level rise and more frequent storms. While collecting data on dunes and running predictive models can certainly help preserve ecosystems and protect coastal infrastructure, Moore cautions that building more dunes is not a long-term solution. Laura Moore is an associate professor in the Department of Geological Sciences within the UNC College of Arts & Sciences.